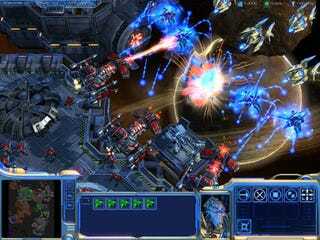 Starcraft is being used to teach resource management skills in a new course offering at the University of Florida - but it's only open to students in the honors college, and students have to have some familiarity with the game. Nate Poling, a Ph.D candidate at UF, came up with the idea and sold his department on it, so IDS 2935 "21st Century Skills in Starcraft," will be offered as an online-only class this coming semester. Starcraft as a college subject isn't new; California-Berkeley offered a course on competitive Starcraft through its renowned Haas School of Business. At Florida, it sounds like Poling's lesson plan will also align Starcraft to business management. Those who run businesses, factories and hospitals must manage according to their knowledge of their personnel's strengths, weaknesses and different abilities, sort of the same calculus involved in StarCraft. "A student who gets a normal education, gets an MBA, and is in the business world, he could realize that something he learned in his StarCraft course helps him think outside of the box," Poling told MIT's Technology Review. "You synthesize this with an MBA program and voila - you have an innovative business practice." He's careful to stress this is a supplemental course, not a replacement for traditional teaching methods. Poling anticipates it'll be a popular offering, but the StarCraft skillz and honors-only requisites should keep him from getting swamped by students wanting to play games for a grade. There is no final examination, but the course does count toward undergrads' GPA.